Pine Breeze Apartel , Baguio City PINE BREEZE COTTAGES, a well-maintained place, centrally located and a 5 minute drive from Burnham Park, offers rooms that suits your accomodation needs. A place where you can spend your visit with total comfort, peace, and security. PINE BREEZE COTTAGES is also suitable for seminars, receptions and other social functions with our multi-purpose hal... more. 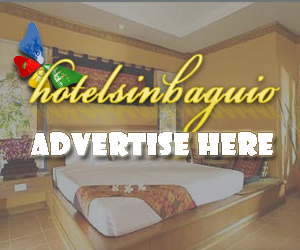 City Travel Hotel , Baguio City Magnificent suites, elegant rooms and a wide range of amenities,City Travel Hotel has much more to offer with affordable rates, a pleasant staff, function halls and Gecko Bar and Restaurant. With Baguio packed up with cultural experiences in fun, City Travel Hotelwill make you experience the other wondrous things Baguio City can offer [caption id="attachme... more. Hotel Elizabeth Baguio City Experience the Mediterranean lifestyle in Baguio City Encapsulating the best of Baguio City, Philippines, Hotel Elizabeth is truly a new found haven for those who wanted to take break away from it all. Situated upon the lush mountains of Baguio and within walking distance from top tourist attractions, guests of Hotel Elizabeth Baguio City are in for a diff... more. Golden Pine Hotel The Golden Pine Hotel Baguio is one of the premier resort destinations for meetings and events in Baguio City. Proven professionals in the convention industry, we do our utmost to provide you with seamless service and flawless program delivery. Our professional staff and service managers will always be on hand to assist you in planning meetings, corporate retreats, weddi... more. Diamond Inn Baguio A place right in the heart of the City of Baguio... a walk to Burnham Park, Session road, Market, Malls, Hospitals, Universities and the famous Cathedral church. Few minutes ride to Camp John Hay, Lourdes Grotto, Wright Park, Country Club and the Mansion House. We are very accessible to all rides heading to different tourist spots and we are stratigically locat... more. Baguio Country Club , Baguio City The Baguio Country Club hails from an immensely rich history of more than one hundred colorful years in the hospitality industry. The Club's remarkable 100 years of existence was celebrated in the year 2005 where its humble beginnings, memorable events and fond memories were cherished in a historical marker- a recognition by the National Historical Instit... more. Ridgewood Residence, Baguio City Enjoy breathtaking view of lush pine trees while dining on our delicious mouthwatering cuisines and snacks in Filipino, Continental and American. Serve on a spacious lawn and garden that is great for special occasions or dine inside our indoor cafe for amiable ambiance. For the more vibrant and active young people, the hotel is surrounded with lush... more. Europa Condominium Villas, Baguio City In 1974, Far East Bank and Trust Co. organized a firm geared towards “productive utilization of real estate”; Fereit Realty Development Corporation. As it’s initial project will rise within a pine forest on Legarda Road overlooking Burnham Park in Baguio City- called EUROPA CONDOMINIUM VILLAS, envisions an investment which may even earn eno... more. Hotel Veniz, Baguio City A relaxing atmosphere, some of Baguio's finest restaurants and our gracious and efficient service await you at Hotel Veniz. Nestled in the heart of Baguio City right beside Burnham Lake, our guests are so close to nature yet never far from the amenities of city life. So whatever takes you to Baguio Ci... more. Inn Rocio, Baguio City Want to revitalize your weary spirit and invigorate your worn-out nerves? Want to enjoy unforgettable moments with your loved ones in the warmth and comfort of home at the beautiful and historic summer capital? Come home to Inn Rocio. Nestled atop a hill overlooking Burnham Park, Inn Rocio was the summer home of the late Martial Law hero Don ... more. Concorde Hotel, Baguio City Magnificant and Unique Design; Attractive, Colorful and Captivating Artworks await your pleasant and perfect stay at Concorde Hotel. Denise Cafe', the hotel's 24-houir coffee shop, offers continental gourmet from its a la carte menu and hearty buffets for breakfast, lunch and dinner. Concor... more. El Cielito Hotels have been providing value-oriented hotel facilities in the Philippines. In 1975, El Cielito Inn - Makati began with just five rooms. As the demand for economical lodging increased, the inn quickly expanded. El Cielito Inn - Makati serves mainly the lodging requirements of the "Top 1000" companies in the Philippines. These companies are also among the biggest in the worl... more. Microtel Inn & Suites Baguio Ideally positioned the Microtel Inn & Suites Baguio is a popular holiday destination for anyone looking for sun, shopping and scenery. Providing elegantly-designed guestrooms, the modern hotel is conveniently located in the center of the city. The three-star hotel is also close to many attractions, such as the Philippine Military Academy, Lourdes Grotto... more. Nestled some 5,000 feet atop abundant gold mines is the cool, pine-scented city of Baguio - a city gifted with natural grandeur and rich cultural heritage. And bosomed amidst this rich floral and botanical paradise lies Prince Plaza hotel - a package of nature's splendor, cordial service and royal elegance. Complementing the relaxing ambience of the city are the hotel amenities which wi... more. Igorot Lodge Baguio, with its lush pine scented hills and cool refreshing climate is an ideal venue for education, training conferences and conventions. After the turn-over of Camp John Hay Philippine government in 1991, AIM was given the oppurtunity to locate its first major off-site training facility in the city. It is now known as the AIM C... more.